How Do I Calculate Net Earnings for Business Taxes? You calculate net earnings by subtracting ordinary and necessary trade or business expenses from the gross income you derived from your trade or business. No matter what kind of business you have, you begin with gross income and deduct allowable expenses to get net income. Gross income is the income received directly by an individual, before any withholding or deductions or taxes. How you calculate net earnings for your business depends on the type of business. For example, a business that has an inventory of products must include a calculation for cost of goods sold. 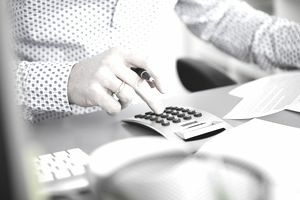 A corporation must include compensation of corporate officers in the net earnings calculation (the IRS wants to make sure corporate officers are compensated reasonably. For a partnership tax return, guaranteed payments to partners must be included in the calculation for net earnings. The calculation for net earnings changes based on the type of report and also for the type of business. In Business Reports and Calculations. Net earnings are used in your business financial reports. Details of net earnings over a period of time (monthly, quarterly, yearly) are reported in your business Net Income (Profit and Loss) statement. The net earnings amount is also used to analyze the success of a company. The most common profitability ratio is net profit margin, which compares net income to net sales. The result is a percentage, and the higher the percentage the higher the net profit. For Tax Reporting. The net earnings amount is the basis for calculating your business income tax. For all business legal types, the amount of tax the business pays begins with the calculation of net earnings. If you are self-employed, your net earnings from self-employment are used to calculate your Self-employment Taxes. Self-employment tax is the tax that self-employed individuals pay for Social Security and Medicare. On Schedule C. To calculate net earnings, a small business will use Schedule C (Profit or Loss from Business), which is part of the individual tax return forms. Some of these calculations are done on separate schedules, and the totals are brought into the main part of Schedule C.
Your business income is calculated, starting with gross receipts or gross sales. Returns and allowances are deducted. Then, cost of goods sold is calculated, for businesses that sell products. The result is the gross profit (gross business income). Other income is also listed. For example, your business may have income from interest, tax credits, or other non-sales sources. Expenses are listed, in specific categories, in alphabetical order. There is a category for miscellaneous expenses too. The result if total expenses before use of your home (called "tentative profit or loss). The net profit or loss calculation is Gross Income less expenses (including home business expenses). For Partnerships and Corporations: You will see a similar process for partnership, corporation, and S corporation income tax calculations. Income received from a limited partnership.